Medical Office Phone System | 8x8, Inc. Choosing a medical office phone system depends not just on the current but also the future needs of your office. For this reason, finding the best phone system for your medical office requires careful planning. The input of key members of your team will be vital, especially those on the front lines. What challenges do they face with the current system? If they could change things, what would a different phone system look like? Is your team distributed in many geographic regions? These are just a few of the important questions to consider. Security is one of the most important features for any medical office phone system. Voice and data should be encrypted. In addition, the system should have access control features in order to ensure that only authorized staff to have access to sensitive PMI. Security and protection of PMI isn't a choice. HIPAA regulations require it. Violating HIPAA regulations can result in extensive damage to the business, from being sued to loss of credibility. Many offices have distributed staff and staying in touch with everyone no matter where they're located is critical to operational efficiency. Remote employees should be able to securely connect into the phone system and have access to all the tools needed to do their job. A mobile app that can access the system is vital for staff on the go. Imagine a doctor sitting in an airport who needs to listen to the latest call from a patient plus associated notes and history. Sure, all of that could be sent as separate pieces but it would take a lot of time. With a unified phone system, everything can be accessed through one app. Call recording is another feature that is required for any medical office phone system. The ability to listen repeatedly to exactly what a patient is communicating can bring a level of clarity that may not have been present during the initial call. Also, additional parties don't have to depend on a single, initial interpretation of the patient's verbal account. They can listen to the source directly. Recorded calls are also often used for quality assurance. Which existing systems does your office use? Ensure that any phone system will work with them. You might think that your finance software doesn't need to integrate with the phone system. Then a year down the road, you want to integrate accounts payable with the phone system so a customer's billing history can be displayed by a rep during a call. But the two systems are incompatible and you lose out on efficiencies. Good planning will help you make the right choices the first time around. Video conferencing is another popular feature, especially with the rise of telemedicine, which is common in medical offices. Features to look for in video conferencing are the number of people that can be maintained while providing crystal clear calls. Additional video conferencing features include the ability to join calls from different devices and easy transition from a voice call to a video call. Discussions with medical office phone system providers will begin to narrow down your choices. You'll also start to form a relationship with certain providers and gravitate toward those whom you feel comfortable with. Your relationship with a provider before any purchase matters because it's a window into what any future relationship will be like after the purchase. When it comes to healthcare, 8x8 provides reliable and compliant cloud solutions at a demanding level rarely seen by other cloud providers. 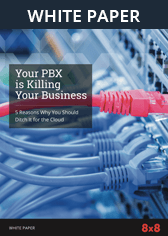 Don't take your chances with a subpar cloud-based telecom system. Call 1-866-879-8647 or fill out our online form to request a no-obligation quote from an 8x8 Product Specialist.